Satellite, Television and Entertainment systems are our speciality. We can design, supply and fit any entertainment system from a very basic single 12 volt TV with maybe a free standing satellite dish or terrestrial aerial to a multi TV system with surround sound, DVD player and the most advanced automatic in motion satellite dome systems plus digital terrestrial aerials. In fact all the little luxuries to make your travelling and stay more enjoyable wherever you are! Our vast knowledge of these systems not only allow us to advise you on the system best suited to your needs, but we can advise you on how to get maximum use from your purchase. 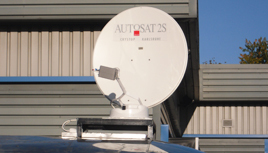 We can supply and install all of the popular makes of satellite systems at competitive prices. Most accessories can be fitted at your home, place of work or even on site using our mobile fitting service. 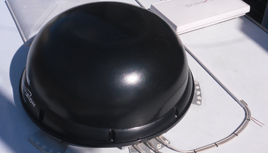 We also supply and fit semi or fully automatic high speed satellite internet systems from Crystop Astra2Connect on the Astra 3 satellite, IPcopter on Hellassat, or the new low cost Astra2 satellite group based internet service provider with a variety of contract packages, one to suit most types of usage. Make sure you don't waste money trying "off the shelf" solutions! Come and discuss your requirements with the experts and find out all you need to know about TV systems. 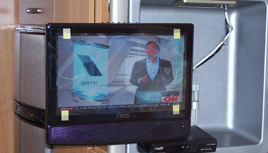 Watch TV anywhere with KVH TracVision®! Approved suppliers and fitters of the leading system - unsurpassed reliability throughout Europe. Contact us to book your installation.